Student athletes were in the spotlight at the March 25 meeting as March Madness is underway across the nation. This month the Board recognized the youngest stars on the court, the A and B team girls and boys elementary district champions. March kicks off a period of time when the Board begins to recognize athletes, as several compete in multiple sports causes calendar conflicts with prior Board meetings after one season ends and another begins. Recognized were Jesse D. Lay Elementary’s A Team Boys and Girls, Girdler Elementary’s B Team Girls and Central Elementary’s B Team Boys. 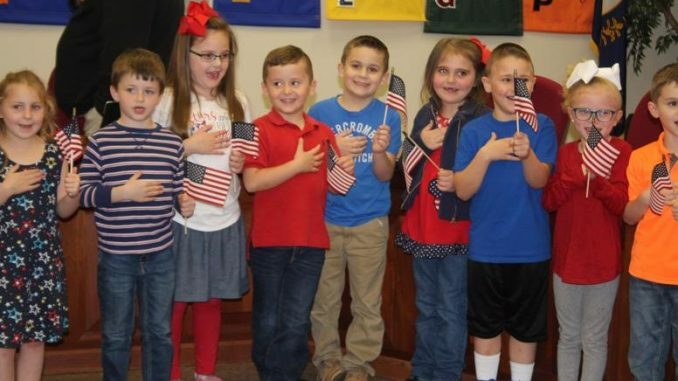 Students from Jesse D. Lay also led the Pledge of Allegiance for the Board at the meeting. Also among the communication items was a service appreciation award presented to former Board member, vice chair and chairman Gordon Hinkle. Hinkle resigned following employment of his daughter in the Knox County school system. The position is now vacant awaiting further action by Kentucky Education Commissioner Wayne Lewis. The Board approved amending the current year calendar to change April 19 from a Teacher Equivalent Workday to a regular day of instruction for students and staff. This is to reduce the number of make up days by one. KCPS is still waiting on approval of non-traditional days by KDE before an official last day for students can be announced. The Board approved contracts with Forcht Bank and Cloyd and Associates. The Board approved a dual credit contract with Somerset Community and a student teacher contract with Midway University. An amended contract for athletic trainers through Union College was tabled to provide Board members additional time to review the contract and discuss the proposal with Union officials. Supplies and services were approved to be advertised for bid for 2019-2020. A staff freeze was put into place for all vacant positions except for allocated, grant, and positions required by law. An exception was added for bus drivers, monitors, and cooks. The official minutes of the March 25, 2019 meeting will be available after Board approval at their next meeting which is set for April 22, 2019.